Is coffee a health elixir or an addictive toxin? The evidence goes both ways. 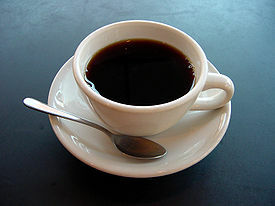 But a study from Rutgers University now casts another vote for the health benefits of coffee. It finds that in addition to drinking that morning cup, you may even want to bathe in some coffee as a way of preventing harmful sun damage or skin cancer. The study published in the Proceedings of the National Academy of Sciences, supports the theory that caffeine guards against certain skin cancers at the molecular level by inhibiting a protein enzyme in the skin known as ATR. Based on lab experiments on mice, scientists think caffeine applied directly to the skin might help prevent damaging UV light from causing skin cancer. Because coffee contains antioxidants (and is probably the greatest source of antioxidants in the standard American diet), it was previously associated with reduced cancer risk. Prior research indicated that mice fed caffeinated water and exposed to UVB radiation (which damaged the DNA in their skin cells) were able to kill off a greater percentage of their badly damaged cells and reduce the risk of cells becoming cancerous. The researchers noted that prior studies found an association between coffee drinking and a decreased risk of non-melanoma skin cancer, and called for more studies to determine whether topical caffeine inhibits sunlight-induced skin cancer. In this study, instead of inhibiting ATR with caffeinated water, Rutgers researchers genetically modified and diminished ATR in one group of mice. The genetically modified mice developed tumors more slowly than the unmodified mice, had 69% fewer tumors than regular mice and developed four times fewer invasive tumors. The study also found, however, that when both groups of mice were exposed to chronic ultraviolet rays for an extended period of time, tumor development occurred in both the genetically modified and regular mice. The researchers believe that inhibiting the ATR enzyme works best at the pre-cancerous stage before UV-induced skin cancers are fully developed. According to the National Cancer Institute, sunlight-induced skin cancer is the most prevalent cancer in the United States with more than 1 million new cases each year. Although multiple human epidemiologic studies link drinking caffeine beverages with significant decreases in several different types of cancer, including prostate, skin and oral cancers, how and why coffee protects against cancer is unknown. The researchers speculated that caffeine may help prevent skin cancer because it inhibits ATR but may also act as a sunscreen and directly absorb damaging UV light. For more information about coffee, check out GreenMedInfo’s coffee research page documenting over 40 health conditions which may respond favorably to its use. NextLoosen Up! How Daily Stretching Can Improve Your Health.